All over the country, neighborhood residents, nonprofit organizations, and local governments are working together to transform underutilized and contaminated properties into community assets such as affordable housing, community centers, maker spaces, playgrounds, parks, and more! But turning a site that is or is suspected of being contaminated (the EPA’s definition of a brownfield) into quality open space is no easy feat. You can’t do it overnight, and you certainly can’t do it alone. and getting it all funded! 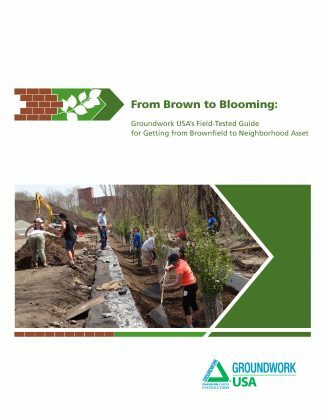 I recently spoke with Cate Mingoya, Groundwork USA’s director of capacity building, about From Brown to Blooming and what it takes to transform a local liability into a community treasure. Liz Carver: Why did you write this guide? We wanted to write a guide that gives folks who are curious about driving change in their communities a high-level picture of the major steps to redeveloping contaminated sites. At the same time, we also wanted to open up a discussion about the importance of meaningful community engagement. We’re still offering free technical assistance to whoever is interested, but we hope this document can be particularly helpful to folks who are on the fence about starting a project and just need a little assurance that there is a path to success—though that will look a little different in every community. In the guide you speak a lot about building relationships. What relationships should be prioritized at the start of a brownfield-to-parks project? That’s a tough one because just like in your personal life, diverse relationships matter. I’d say, though, that you should start by nurturing relationships with the community closest to the brownfield site. Ultimately, any equitable redevelopment of that site must benefit the community first, and you won’t have any idea what site abutters and members of the broader community need until you spend a good chunk of time asking questions and deeply listening. Some people worry about the impact that adding trees or parks to the neighborhood can have on rents. Does this come up in your work? How do you advise technical assistance clients? Green gentrification—rents and property values rising in response to community improvements—is a real concern and challenge. But just as building a park isn’t going to fix every challenge that exists in a community, it’s likely not going to be the sole cause of rising rents. Parks have tremendously positive physical and mental health impacts—but those impacts are useless to community residents if they’re priced out of their neighborhoods. One of the reasons we stress building strong coalitions of stakeholders (including residents, the business community, organizations doing parallel work, and local government) is that those relationships are powerful, not just for the creation of parks and other green spaces, but also when it comes time to solve other community issues. Imagine harnessing the momentum and community-ownership that went into fixing up a brownfield site and directing it towards the creation of a land bank or a community land trust so that residents can build, from the ground up, the kind of place they want, and can afford, to live. There isn’t any big, 100% solution (or 100% cause) to gentrification and displacement. It’s going to take a lot of smaller 1% solutions that will only come into being through strong community relationships.